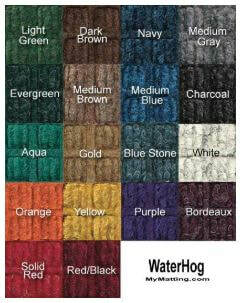 ﻿WaterHog carpet entrance mats scrape and capture debris away and holds it, trapping it while keeping your floors clean. The Carpet Nubs have rubber underneath so it will never break down. Available in two Backing types – Smooth Backing for hard floors and Cleated Backing for carpet floors.Custom lengths are available also.